Even the biggest and best entrepreneurs run into everyday problems! Problems like colds, sore throats, sleepless nights, an inability to focus, or being zapped of energy - you know, the regular life stuff. Only, as an entrepreneur, it can really stink because our entire business depends upon our ability to cope. Nothing like prepping for a webinar with a cough, right? Nooooot so much! Herbs are really well known for their healing properties, and they're natural! 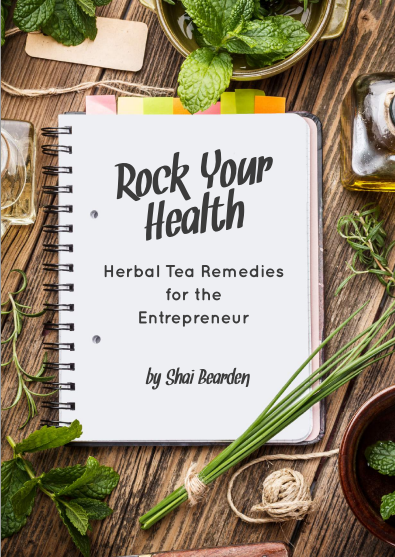 Most biz owners don't have time to take up a hobby in herbalism, so I've put together 33 awesome recipes, organized by problem-type, just for you! I even tell you where you can purchase the herbs, at a super wallet-friendly cost, and have them delivered right to your door. How's that sound for flu-season? Better than driving to the pharmacy for yet another bottle of Nyquil, eh? Go ahead and grab your copy, so you can sleep better, feel better, and rock your biz! With your purchase, you get the pretty eBook, *and* a second printer-friendly copy, so you can stash one in your kitchen and keep one in your tablet!